Due to variability between products, researchers tend to oversaturate their experiments by applying high concentrations of cytokines to be sure to see an effect. However, oversaturation can not only harm your cells but also cost you more money. One solution to overcome variability would be to do lot-to-lot testing which is rather time- and cost-ineffective. An unique lot-specific activity value: Our Premium-Grade cytokines come with a lot-specific activity value. This eliminates the need for time- and cost-consuming testing every time you purchase a new batch. Standardization with the international standard: Calibration with a defined standard is done to normalize results and minimize variability. We provide calibration with a defined international standard provided by the National Institute for Biological Standards and Controls (NIBSC), a WHO organization. Figure 1: Human GM-CSF biological activity varies between vendors. A cytokine’s specific biological activity depends on the vendor and the lot used (Figure 1). This is true even when samples are measured in parallel, using the same assay, the same batch of cells, and the same set of conditions. With MACS® Premium-Grade Cytokines’ lot specific activity value, there is no need to worry about variability and reproducibility in your cell culture experiments. You can confidently apply the same amount of cytokines every time. Human GM-CSF biological activity varies between vendors. Miltenyi Biotec's Human GM-CSF, premium grade (left bar) shows higher specific activitiy than other commercially available product (right bar). 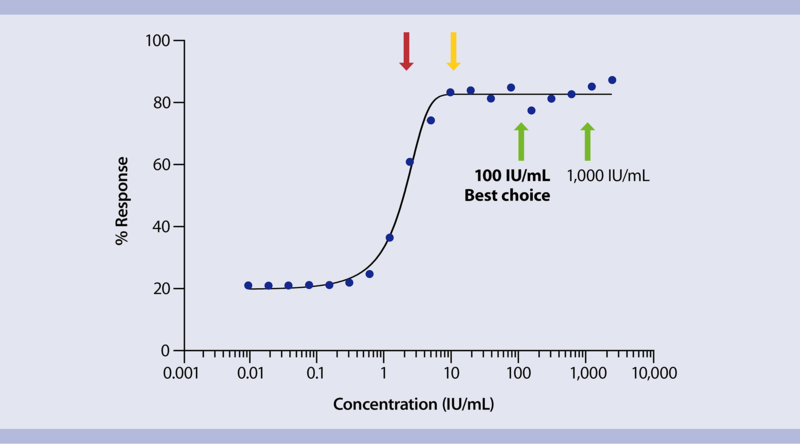 Figure 2: Efficient cytokine usage with specific unit-dosing. Researchers oversaturate cell culture experiments due to variable cytokine activity. With the given lot-specific activity, you can use cytokines at precise concentrations and save reagents. Therefore, you no longer need to oversaturate your cell culture experiments and can use up to 10 times less than the usual quantity of cytokines (Figure 2). Green arrows indicate concentration of cytokine input to reach maximum cellular response. Identical activity can be reached with cytokine concentrations of 100 IU/mL and 1000 IU/mL. Yellow and red arrows indicate insufficient cytokine input. Performing lot-to-lot testing every time you purchase a new batch of cytokines is just not the right solution to the problem of cytokine variability. Such testing is an unnecessary waste of valuable time and resources. MACS® Premium-Grade Cytokines’ unique feature – a lot-specific activity value – allows you to use your cytokines right away. Learn more about MACS® Premium-Grade Cytokines and see how you can minimize variability and improve reproducibility in your cell culture experiments.